Want a project? This is a unique property looking for the right buyer to bring it back to life. Give it some TLC to use it for yourself as a cottage or possibly earn some extra income as a rental. Current use is a 4-unit rental (2 units-ML, 2 units-UL). Extra finished area on 3rd floor/attic. 3 storage sheds. Laundry in detached building(dryer only). Septic about 10yrs. old. 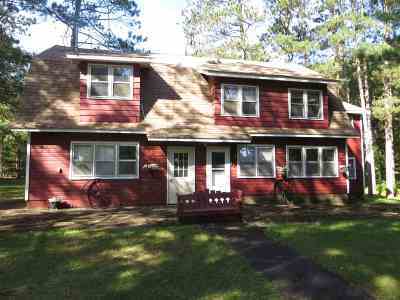 Located in walking distance to beautiful Pleasant Lake (public beach) & ATV/Snowmobile trails. Only about 4.5 miles from town & highway access. Approx. 1 hour from Madison, 30 mins from Plover/Stevens Point, 45 mins from WI Dells. Items Included: Everything Included As Seen In/On Property Except Tenant's Personal Property. Appliances.